‘Tis the season for sharing all kinds of sweets, from sweet nothings for your loved ones, to heart-warming messages for your friends and maybe even a gratifying staycation for your significant other or a relaxing spa date for yourself to celebrate the Day of Love. And as a Valentine’s special, Piip Mobile, the go-to mobile application for personalized location-based promos and deals, launched “Treats for my Sweets” Valentine’s promo with Dairy Queen to bring you a heartfelt celebration with friends and loved ones for FREE. Participants can avail of this special treat by downloading the Piip app, available on Google Play Store and IOS App Store, within the pre-promo period February 9 to 13, 2018. Once registered, locate the participating Dairy Queen branch promo offer nearest you then Piip It! Lucky winners will be notified to claim the FREE Valentine’s Day Treat on February 14, 2018. 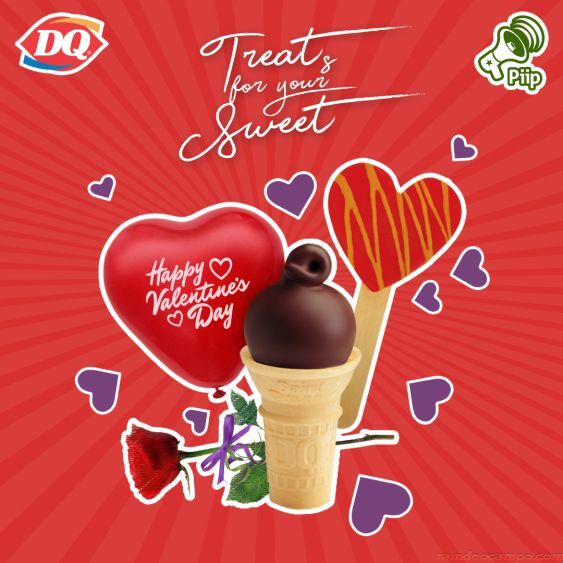 Winners can choose to claim a FREE Dairy Queen Dipped Vanilla Cone or Dairy Queen Valentine’s Day Dilly Bar with red roses or heart-shaped balloon. Download the Piip app and register now to have a malu-Piip Valentine’s Day! For more information about the promo, check out Piip PH’s facebook page at www.facebook.com/Piip.PH.